It’s no accident that the Metropolitan Museum of Art’s exhibit, Choirs of Angels: Painting in Italian Choir Books ends about the year 1500. After all, by the 16th century, the monks who illuminated manuscripts were largely out of work as a piece of German technology changed the world: the printing press. The Vatican Library, now considered one of the finest and most exclusive collections in the world, consisted in 1420 of just three hundred volumes. Soon thereafter, fifteenth-century Italy was consumed by a manuscript collecting craze. Manuscripts, chiefly texts by Greek and Roman philosophers, were copied by hand in monasteries across Europe and became highly prized. The wealthy and learned competed to acquire the most beautiful manuscripts as pieces of art as well as symbols of knowledge. Pope Nicholas V (1447–55), an avid collector of manuscripts, ransacked monastic libraries in search of ancient Greek and Latin texts. In 1450, an invention in a small town in Germany would redirect this bibliophilic fervor and prove to be the most influential invention of the Renaissance: the printing press. The first printing press arrived in Rome by 1465; soon thereafter, the ancient texts so treasured in Italy were being printed cheaply and efficiently in Italy itself. To illustrate the dramatic impact of the printing press, consider this: forty-five scribes could, under ideal conditions, produce a maximum of one hundred manuscripts in a year period. The first printing press in Rome, run by two Germans, Sweynheym and Pannartz, printed twelve thousand books in its first five years of production. By the 1480s, there were more than one hundred presses in Italy. By 1500, fifteen million books had been printed in Europe—more than the sum total of all manuscripts produced in the preceding millennium. In the sixteenth century, more than 150 million books were published in England alone, a country with a population of only four million people. Suddenly, a library of three hundred volumes looked a bit small. 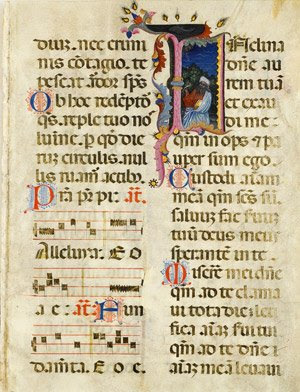 But in the Met’s Medieval Sculpture Hall, the exhibit of choir books highlights that period of creativity in miniature just before the printing press became supreme. Elegantly displayed amongst the medieval sculptures of Mary and the saints, the illuminated pages are a remarkable exhibit of skill, imagination, and detail. Choir books contained settings of the mass to be sung by priests and choirs. And before the printing press, each had to be produced by hand. 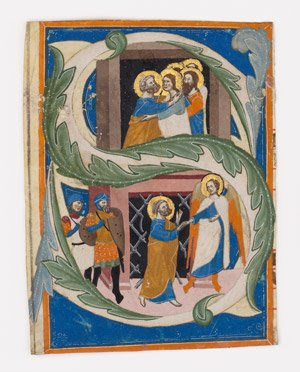 The most magnificent copies were illuminated – decorated with scenes from the text, generally in the top, outside corner of the page. Artists used gold and rich paints to create scenes of angels, Biblical stories, and images of ordinary life creating works of art that were both beautiful as well as useful. 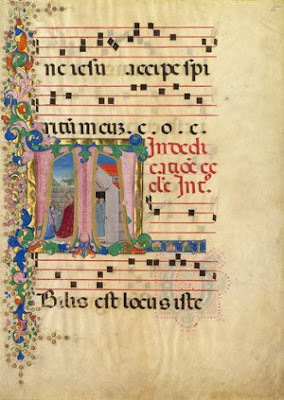 Choirs of Angels focuses on the nexus of illumination: works from Florence and Siena. The finest work of the period came from the artists breathing Tuscany’s rarified air. I truly love illuminated manuscripts and was delighted to see a wide range of subjects amongst the collection. And several of the images surprised and delighted me. In particular, I enjoyed a lovely little image of St. Peter being freed from prison and the image of three monks holding hands and singing. Sadly, many of the images have been cut away from the music they once illustrated. Choir books were sold off whole or in pieces at various points in the last 200 years. Many collectors were only interested in the illuminations, so the music itself was discarded as unimportant. And the churches and monasteries that were doing the selling needed funds. If you are in New York this spring, visit the Metropolitan Museum of Art. Choirs of Angels is on display in the Medieval Sculpture Hall until April 12, 2009 (Easter Sunday). There are no additional fees for the special exhibit. Can’t make it to New York? Check out the images on the Metropolitan Museum of Art’s website. Museo San Marco (Florence, Italy): once a monastic community, Museo San Marco has an incredible exhibit of the tools and techniques used in illuminating manuscripts. Next time you are in Florence, make sure you visit Museo San Marco which is also home to many great masterworks by the frescoist Fra Angelico. GORGEOUS! wow. thanks for sharing this! I agree... these are BEAUTIFUL! Wish I hadn't missed the show; didn't know about it. When might it come around again, if ever? So inspiring seeing the images. Can't wait to try and do some myself.